A lot of new things have been circulating around Twitter this week, including people only worried about a Jaguar and not a stupid lady who got herself attacked by a jaguar. Also Mama B tests the vans and croc flipping challenge. Remember to watch Paw Patrol on Friday! The Jonas Brothers are back! MoMo is also back, but that's because of stupid rumors. Paw Patrol has a new episode today! And it's our 1 year anniversary!!!!! YAY!!!!!! Youtube had another freakout when advertisers started pulling out, so they attacked the creators instead of the real problem. And somehow my sisters are the face of the fight against it all. We also talked about how Brother Nature found an animal that doesn't like him, and much more. And a big shoutout to our sponsors, Paw Patrol and Modern Fertility! Let's keep it family friendly people! The main things that happened this week on the internet were Shane Dawson exposing Chuck-E-Cheese, Miley Cyrus sending weed to people, the Jussie Smollett story took an unexpected turn, and Shawn Mendes destroyed the internet. This podcast was HECTIC! At one point Colleen walked in and kicked mama B out, sat down, and spilled TEA about the Shorty nominations and touched on the vlog squad klafluffle. Mama B comes back in, and we discuss Youtube getting rid of the dislike button, the boringness of the Super Bowl, and of course laid down some chicken facts. Cardi B makes us figure out what Dog Walking someone means, Rams are going to the Super Bowl, Youtube has a scammer problem, Tender is agest, Hulu is super petty again, and the Dolan twins have to deal with literal human garbage. Also, Mama B downloaded an app just for chicken sound effects. Mama B surprises us all when she randomly pulls out some AMAZING jokes! We also covered the Jake Paul and Ricegum gambling scandal, Taylor Swift's failed social media app, O2L's reunion, and much more. We decided to live stream us recording this episode, so mama b got more awkward than normal. But we talk about all the people getting sued, Aladdin's fail, and Twitter's top headline this week. OMG COLLEEN HAD HER BABY! WTF!!!!!! Does anything else matter? Also, Netflix is trying this terrible replay button. It's trash. We play 20 questions Christmas edition. And we have two sponsors! Zola and ScentBird! 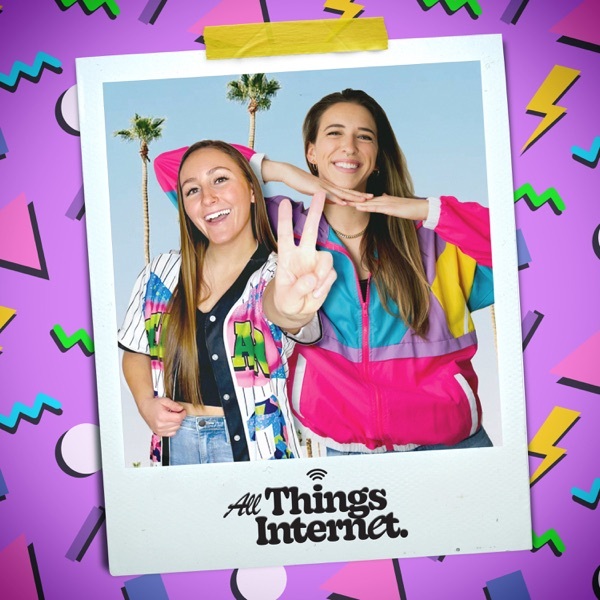 AllThingsInternet promo code for both! YouTube Rewind, did anyone think it was good? We did a lot of AMAZING tongue twisters. Like... amazing. And we have two sponsors! Ritual and Storyworth! Ritual.com/AllthingsInternet and Storyworth.com/AllThingsInternet for discounts on awesome things! Ariana broke the internet, Colleen raised money on the internet, Payless tricked influencers, and we have two sponsors for today! Scentbird and Follain! Use promo code ALLTHINGSINTERNET for some sweet deals at both. Mama B discovers what a local is. Disgusting! But other things are discussed, like Shane Dawson wanting to do a docu-series on Justin Bieber, Colleen Ballinger and Wreck-It Ralph both break the internet, and much much more! Mama B figured out a new iPhone hack that she's obsessed with. Justin Bieber got married, Will Smith has baby mama drama, there's Facebook and Instagram news, and of course we talk about Thanksgiving and me not washing my feet. A lot of terrible people did terrible things this week. But we have the power to vote Nov. 6th! Also... don't worry, scientists made bricks out of pee. Yes. That's right. WE ALSO HAVE A SPONSOR! Visit MyLola.com and enter in ALLTHINGSINTERNET for 40% off! Get those organic cotton tampons! Starting the podcast right by embarrassing mama B right off the bat. Covering all the main topics like Ariana's breakup, Shane's documentary with Jake Paul, and a bunch of airlines dealing with TERRIBLE passengers. Then Mama B FINALLY figures out the game First Word! Talked about some VERY newsworthy things. VERY. NEWS. WORTHY. Also tried to stump mama B with some riddles but she is actually a genius. We are also sponsored by Hello Fresh! Use promo code AllThingsInternet60 at HellFresh.com/AllThingsInternet60 for money off!!! COLLEEN AND MIRANDA LIPSTICK AVAILABLE NOW AT MirandaSings.Com YAY!!!!!!!! Also other things happened in the news. Kanye West wants slavery to be allowed again apparently? Shane's new series has Logan Paul pissed, and we tried to hum some songs. It's a blast!!!! A typical bantering episode. Mama B has to be taught not to fake vomit when she doesn't like a food, Andrew is in the room and keeps trying to participate without a microphone, and the discussion of if video games are actually a time waster or not, gets passionate. Recording at 9pm Sunday night after a LONG weekend and 12 cups of coffee in 48 hours... Things got weird. Rachel sweat a lot and mama B couldn't stop giggling while talking about the new iPhones, Colleen KILLING IT in Washington DC, and Shane Dawson's new series. Definitely hit serious topics though like: the Typhoon hitting Asian, the Hurricane hitting America, and Trump denying the deaths of 3,000 people hit by Hurricane Maria (but climate change totally isn't real). Happy Hot Dog Day! While we touch on a few serious/sad topics in today's episode, we still have some fun discussing Cardi B, Ford's exploding seatbelts, playing the humming game, and so much more! Plus this is our first sponsored episode! Make sure to go to Audible.com/ALLTHINGSINTERNET for a free 30 day trial and your first book is free! Or text ALLTHINGSINTERNET to 500500 - Thanks Audible! Ariana's album finally dropped!!!! But more importantly, a new game has been created. You have to guess who tweeted it: Miranda or Trump. Mama B just got back from bus tour so she's a little "jetlagged". A new game is played and fun is had. We wanted to know people's unpopular opinions, and y'all DELIVERED!!! Covered sad stuff, happy stuff, and then played Family Feud but it was a total fail because SOMEONE refused to hand the phone over to someone else that was more capable of using it!!!!!!!!! Mama B was on another level during this podcast. Her brain left us and it got weird. Mama B thinks this one got too intimate too fast lol. She also almost peed her pants while playing 20 questions. And if that isn't intimate, then I don't what is. Obviously we had to talk about Colleen being so pregnant. We also talk about Shane's TanaCon doc, a robot that got fired from it's job after 2 days, and a hashtag that brought lots of laughs and heated discussions. Cousin Andrew was also in the room pooping on everything. Of course we talked about VidCon, TanaCon, and much more. Then named Mama B's new chicks! This one is full of laughs. Mama B finally got her new baby chicks, discovered a new fruit, and runs around the house while recording. But also cover topics like Beyonce's new song, Father's Day, the ads playing before youtube videos, and much more. A calmer recording day for us. Matt does enter the room but doesn't speak, we get mad at our peeing abilities (or lack thereof), and of course we touch on very important topics like Erikleen, Pride weekend in LA, and chickens. Covered a lot of news from the last week: Ariana Grande, real life spier-man, and a flower with man parts. Mama B took charge of this week's games. And of course Rachel gets heated about some topic at the end. Mama B definitely almost pees her pants from laughter in this one. Blaze runs wild while we talk about serious and not so serious issues happening this week. Also, mama B plays the recorder.... yes, the recorder. This wonderful episode is full of all the same banter and fun, except our friend Teeny joins us! A mom, who on Mother's Day, escaped her children. Rachel starts out the show by immediately embarrassing her mother multiple times. Then they cover all the normal things and play "Finish That Lyrics". It's just a good one. Trust me. It took 9 episodes for us to figure out our mics. WOW! Obviously we talk about Kanye and Yodeling boy's single. In this episode of All Things Internet, Rachel and her mom, Gwen, get in several intense heated discussions. But it doesn't really matter, because this is all just a simulation. Rachel Ballinger and her mother, Gwen, talk about Coachella, the Starbucks arrest, and angrily try to say some funny words. Cousin Andrew also sits in during the podcast and laughs at random things. Rachel and her mom once again go over internet news; Youtube HQ shooting, yodeling kid, more Instagram updates, and much more. Lastly, cousin Stefanie joins us and ends up chiming in with some helpful money tips! Rachel Ballinger and her mom discuss the newest Spongebob meme, what in the world finsta means, and much more. Youtuber, Rachel Ballinger, and her mom, talk about all thing internet. Covering the new Spongebob meme that could and is harmful, Rihanna's reaction to Snapchat, and much more. Youtuber, Rachel Ballinger, and her mom talk about youtube boxing, halo eyebrows, The Rock, getting paid dust, and much more internet related things!